UPDATE:This story was updated on Nov. 28 and 29 to reflect information about the insurance on the launch, and to add an assessment from an industry official on the failure’s impact on upcoming missions. PARIS — A Russian Soyuz rocket carrying a Russian meteorological satelilte and 18 smaller satellites, including 10 for Spire Global and a technology demonstrator satellite for Telesat that would reserve radio frequencies failed to reach orbit on Nov. 28 in what initial reports said was an erroneous command loaded on the rocket’s upper stage. The Russian space agency, Roscosmos, had no formal assessment of what went wrong in the early hours after the Soyuz-2-1b rocket lifted off from Russia’s new Vostochny Cosmodrome in eastern Russia. 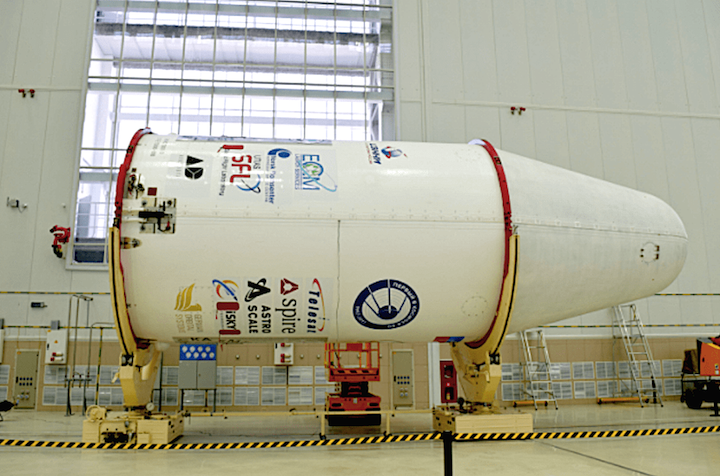 It issued a terse statement four hours after the launch saying only that the 2,750-kilogram Meteor-M No. 2-1 satellite, which was the principal payload, had been placed into a wrong orbit and was not communicating. The Meteor satellite was insured for 2.59 billion Russian rubles, or $44.3 million at current exchange rates. The Spire satellites were not insured, industry officials said. The official said that depending on the initial telemetry data, the launch of a Zenit rocket with a Fregat upper stage carrying the Angosat telecommunications satellite for Angola, initially set for early December from Russia’s Baikonur Cosmodrome but recently shifted to late December, might suffer further delays. Similarly, a Soyuz-Fregat launch from Baikonur of two Russian Kanopus Earth observation satellites, set for Dec. 22, could be put on hold pending results of the investigation. The Nov. 28 launch was the second Soyuz mission from Vostochny, following an inaugural flight in April 2016. A European industry official with knowledge of the launch said the initial reports were that the rocket’s Fregat upper stage was loaded with an erroneous command that caused it to fail after separation from the Soyuz vehicle. Roscosmos said the lower three stages of the Soyuz vehicle performed as expected, with the Fregat stage separating some nine minutes and 23 seconds after liftoff. The Fregat was expected to perform a complicated mission including seven reignitions over five hours to place the Meteor and 18 small satellites into different orbits of between 600 and 1,000 kilometers in altitude. Fregat then would have been sent on a destructive reentry path, with its remaining pieces to land in the Pacific Ocean. The 18 small satellites on board had secured their places on the mission via GK Launch Services of Russia, the company that has been given responsibility for commercializing Soyuz launches from Russian spaceports. 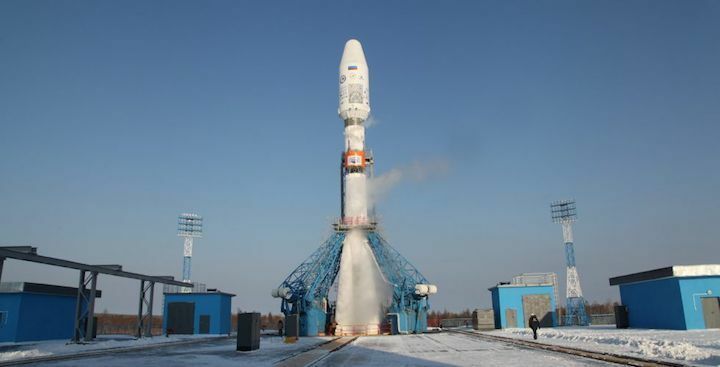 In a statement, GK Launch Services said it was still analyzing the situation and awaiting clarification from Roscosmos. San Francisco-based Spire, which is building a business using a large constellation of low-orbiting satellites for maritime tracking and commercial meteorology, had 10 4.5-kilogram Lemur-2 spacecraft on board. Canada-based Telesat placed the first of two prototype LEO Vantage broadband telecommunications satellites on the vehicle. The 70-kilogram satellite, built under the general system management of SSL by the University of Toronto Institute for Space Studies (UTIAS), is one of two prototypes designed to prove Telesat’s chosen broadband constellation technology choices and to reserve the radio spectrum with the International Telecommunication Union. A second Telesat prototype, built by Surrey Satellite Technology Ltd. of Britain, is scheduled for launch in December or January aboard an Indian PSLV rocket. Under ITU rules, Telesat need launch and operate only one satellite to register its full constellation as having been brought into use. Telesat purchased insurance covering both satellites. There is no claim unless both are lost. Also on board were the AISSat-2 maritime-tracking satellite for the Norwegian Space Centre; the 22-kilogram IDEA OSG-1 orbital debris-monitoring satellite for Astroscale Japan Inc.; the 11-kilogram Corvus-BC-1 and BC-2 Earth observation satellites, owned by AstroDigital US Inc.; and the 3-kilogram D-Star One amateur-radio satellite for German Orbital Systems GmbH. The Russian Soyuz and Indian PSLV rockets are the most-popular launch vehicles for the fast-growing cubesat sector, which includes government, commercial and university-research satellites. The PSLV failed in August after its fairing did not separate. Roscosmos specialists have found three fragments of the first stage of the Soyuz-2.1b carrier rocket in the north of the Amur Region in the Russian Far East, local district head Andrei Lozhechkin told TASS on Wednesday. The carrier rocket blasted off from the Vostochny space center on Tuesday. "Roscosmos specialists who surveyed from aboard a Mi-8 helicopter the district of the probable fall of the first stage, found its three fragments on the territory of the Tynda district," head of the Zeya district Lozhechkin said. The fragments that were found were cut into parts and delivered to the town of Zeya from where they will be transported by vehicles to the Tsiolkovsky research center at the Vostochny cosmodrome, he said. It was reported earlier that the rocket’s fragments after its launch should have fallen at the boundary of the Zeya and Tynda districts. The Fregat booster with 19 satellites most likely fell down into northern Atlantic, Russia’s state space corporation Roscosmos said on Friday citing findings of the commission that probed into the abortive launch from the Vostochy space center on November 28.